When in Manila, everybody knows that Malate is an area of the city that never sleeps. As a center of nightlife and tourism, it is one place you can’t ignore visiting and that’s what we did! For our staycation, we booked at a very central and very affordable hotel, the Regency Grand Suites. Located in the Birch Tower Condominium in J. Bocobo St. in Malate, this place is only a walking distance from the huge Robinsons Place Mall and other places of interest in Manila. The 50 storey Birch tower building is also shared by 3 other hotels allocated to different floors. 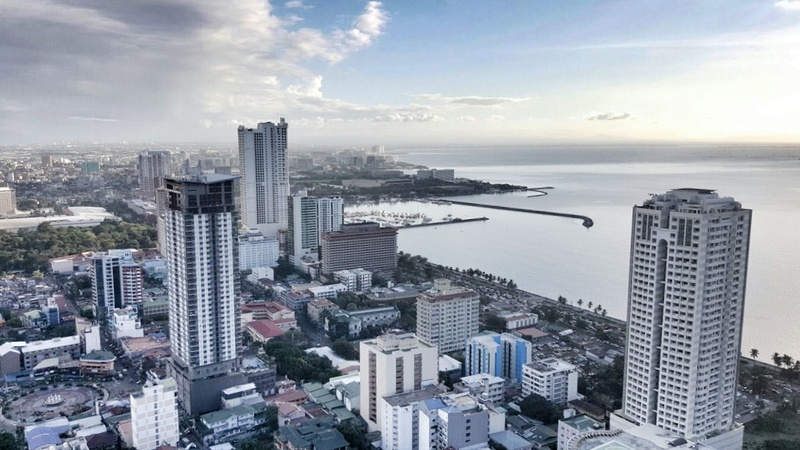 Luckily, Grand Regency Suites booked us on the 49th floor and we were just in awe because of the view over the ocean and city. Each suite has a small balcony but when you go out, you will be amazed at the view. If there is one place to catch a picture perfect sunset, it is right here! Guests can also enjoy some drinks and cocktails in their small bar next to the reception area and desktop computers are also available to use in case you want to stay connected with your loved ones. But with the availability of a Free WiFi service in every room, it is not really necessary. When we checked-in we were astonished with how spacious and elegant the rooms look. Guests can simply just relax while watching satellite on this very soft bed and comfy linen. Another good thing about staying in Regency Grand Suites, is the availability of a small kitchen where guests can prepare or heat up light meals. With spacious rooms comes very spacious and clean bathroom. The water pressure from the shower is also great. While walking around the busy streets of Malate we saw this bar located right across the street from Regency Grand Suites. Tambayan Gastrobar provides guests with signature cocktails that you will surely enjoy. The atmosphere is very cozy and the ambiance was very laid back. They also have acoustic band performances during weekends making the place a perfect place to relax and chill. This is definitely a must try! After a nice drink at the Tambayan Gastrobar, we went back to the room. But just before we hit the bed, we went out onto the balcony to see the city lights. It was a majestic view! I could not think of any place to stay in Manila where one could see a view this great! Guests of Regency Grand Suites can also enjoy the other amenities that are being offered such as the fitness gym located on the 9th floor of the Birch Tower. Also located on the 9th floor is a swimming pool that is perfect for laps or to simply just lounge and relax in the cool waters after a busy night in the city. With all the amenities, luxury rooms to choose from that offer great view of Metro Manila, great service from staff, and most of all the affordability of stay, Regency Grand Suites really is a great choice if you are ever planning to stay in the Manila area – specifically in Malate. The place looks really spacious. They also have clean rooms and excellent facilities plus an overlooking view. Very nice! I'm a sucker for hotels with great views. Ganda! Plus the amenities are a big plus. Wow that's what everyone like, I mean you can enjoy the same thing as you can enjoy in a 5 star hotel but this time it is just light in the pocket.